Additional recordings featuring Kim are available on the Audio Samples page. 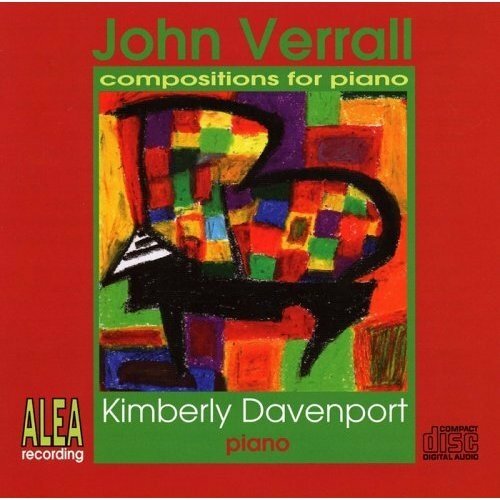 Kim’s first solo recording, John Verrall: Compositions for Piano, highlights her interest in performing and recording new or ‘under-represented’ works for the instrument. John Verrall (1908-2001) was a 20th century American composer whose body of work includes a wide variety of instrumental, orchestral, chamber and vocal music, as well as three operas and a film score. During his long tenure on the faculty at the University of Washington, John Verrall was a beloved teacher and mentor to hundreds of young composers and performers, including Michael Davenport, then a young clarinetist at the university. It was through her father and duo partner Michael that Kimberly became aware of Verrall’s powerful Piano Sonata. Her fascination with the work led to the discovery of more, and finally to this recording. The physical CD is available for purchase from Alea Recording and Amazon.com. Prefer to download? Visit CDBaby.com to download either individual tracks or the full album!